January 2015 n Performance & Hotrod Business n 111 FROM THE HOTTEST STREET CARS TO THE BADDEST PRO MODS WE CAN FUEL YOUR RIDE WE CAN FUEL YOUR RIDE YOUR RIDE 913.647.7300 AeromotiveInc.com Made in USA. DesignEngineering.com • 800-264-9472 DISTRIBUTOR AND DEALER INQUIRIES WELCOME NEW PRODUCT RELEASE RELEASE RELEASE RELEASE The latest products and innovations from Design Engineering. Call today for the 2015 New Product flyer RELEASE RELEASE The latest products and The latest products and innovations from Design innovations from Design Engineering. 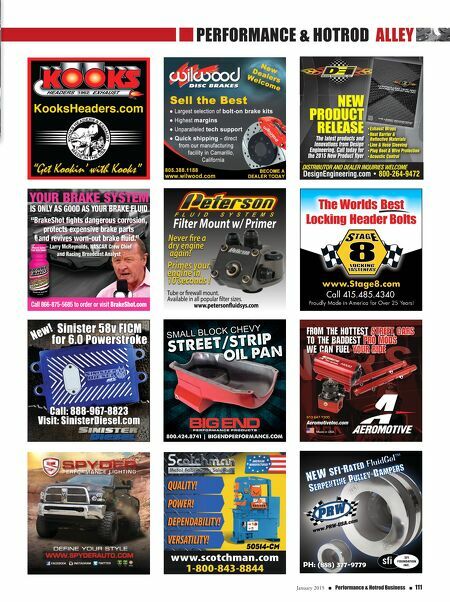 Call today for the 2015 New Product flyer •Exhaust Wraps •Heat Barrier & Reflective Materials •Line & Hose Sleeving •Plug Boot & Wire Protection •Acoustic Control NEW PRODUCT RELEASE RELEASE •Exhaust Wraps •Exhaust Wraps •Exhaust Wraps •Exhaust Wraps •Exhaust Wraps •Exhaust Wraps SMALL BLOCK CHEVY C M Y CM MY CY CMY K PRW Ad Jan 2015 PHRB.pdf 1 11/21/2014 12:30:21 PM www.scotchman.com 1-800-843-8844 VERSATILITY! DEPENDABILITY! POWER! QUALITY! n Performance & Hotrod alley Filter Mount w/ Primer Tube or rewall mount. Available in all popular lter sizes. 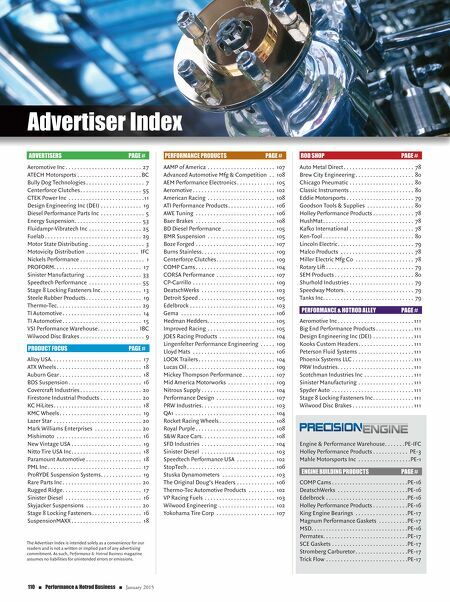 www.petersonnuidsys.com Primes your engine in 10 seconds ! Never re a dry engine again!